NYC, 05/21/2019, 11:30AM. If Beale Street Could Talk (2018): Oscar Winning Drama Based On A Novel. 119 min. Director: Barry Jenkins. 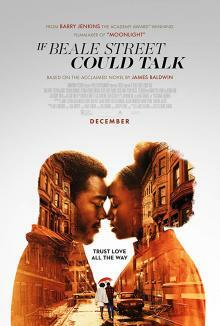 If Beale Street Could Talk is based on James Baldwin's novel of the same name. The film received numerous accolades and nominations, including Best Supporting Actress wins for King at the Academy Awards and Golden Globes. It was also nominated for Best Motion Picture, Drama and Best Screenplay at the 76th Golden Globe Awards and Best Adapted Screenplay and Best Original Score at the 91st Academy Awards.